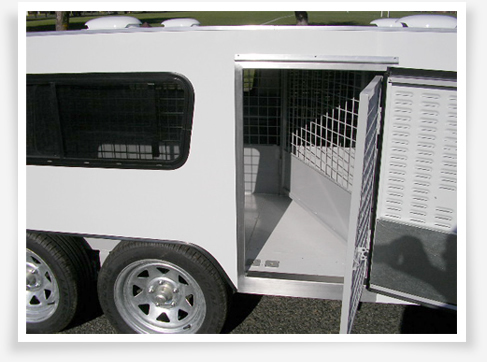 K9 Caravans is a division of Wassco Engineering, one of New Zealand's most innovative engineering companies. General Manager Gary Neal owns and shows St Bernards. He was concerned with the lack of quality dog caravans available in the marketplace, and like many other dog lovers, wanted to know his dogs would be safe and comfortable when he took them to show. In 2006, the team at Wassco Engineering had a gap between jobs, so they decided to construct a caravan themselves. The six-berth caravan was taken on the road, and Gary barely had time to stop the car before a lady pulled out her cheque book to buy it off him. He is currently onto his sixth caravan for the same reason.